SuperEDIT can dramatically improve productivity and you can create high-quality applications. You can feel the effect when you define entries in the application screen. In the Delphi comes with Microsoft VB, VC and Edit components. However, had coding every time because they assume characters enter number and date, check processing. SuperEDIT offers to you as a component to improve it dramatically. Each easy-to-use interface that provides the features big farewell to eight. InpText/LabeledText component (below the text input component), have automatic phonetic guide function, automatically generated furigana character species limited input does not accept only a certain type of character and Chinese character data type. Character type limited input Text input components, you can easily specify the type of character to be allowed to enter the property. In this property, kanji, hiragana, katakana, alphabet, numbers, from the symbol, you can specify the type of character that allows input. In addition, kanji, in all of the character types, except the Hiragana, it can also be distinguished from full-width and half-width. Automatic check function of the input character Text input component checks the entered characters, and automatically eliminates a character other than the specified character type. For this reason, you can greatly reduce the tedious coding for prevent typing errors in the end-user. Automatic furigana function By the input such as names or addresses, I often attach furigana to kanji data for later data searches. Because there is a function to generate furigana automatically just to input kanji data to the text input component, A burden of the input work of the end user is reduced drastically. In addition, the letter class of furigana can appoint full size katakana, a hiragana letter other than half size katakana and can send furigana which I acquired to the different input component. High formatting features degree of freedom Text input component can appoint the acquisition of the focus, a color and a font of the control at the time of the loss. Therefore, because can judge an input position intuitively; at the time of the input of the end user can relieve stress. Guidance display function Text input component, when the focus of the acquisition, will be able to display the Hint string in the status bar. Therefore, since the coding for displaying the input guidance is not necessary, it can be reduced man-hours. InpNumber／LabeledNumber コcomponent (the following, Numerical value input component) provides a positive or negative number and the amount of input interface. High formatting features degree of freedom Numeric input component, currency symbol (\, $) and display the presence or absence of scale comma, display color of a negative value, can be used to specify the display format, focus control of colors and fonts at the time of acquisition and loss of time of zero you. Automatic check function of the input character Numeric input component, single-byte numbers and – (minus) and the specified point symbol (“.” The default value is), so has the ability to eliminate the character input other than to check the validity of the numerical input in the code There is no need. In addition, you can also limit the numeric input that exceeds a preset upper limit and lower limit. Calculation of consumption tax In the numeric input component, using TaxCalc methods and AsTax, AsPrice, the AsTotalPrice property, you can easily calculate the consumption tax of tax and outside tax. Drop-down calculator / pop-up calculator Numeric input component, you can easily use the drop-down calculator with the specified property. In addition, also provides pop-up calculator call methods that you can freely specify the call keys and display position. Thus the user is able to perform using a calculator simple calculations in the input can also be passed to the input component results. Guidance display function Numeric input component, when the focus of the acquisition, will be able to display the Hint string in the status bar. Therefore, since the coding for displaying the input guidance is not necessary, it can be reduced man-hours. InpDate／LabeledDate component (the following, date input component) provides a date input interface that corresponds to the year. High formatting features degree of freedom The date input component can appoint the acquisition of the focus, a color and a font of the control at the time of the loss. Therefore, because can judge an input position intuitively; at the time of the input of the end user can relieve stress. Moreover, by combining the DisplayFormat property type is divided display format, it can be easily implemented by specifying the properties of the display of complex date. Automatic check function of the input character Date input component, single-byte numerical value as the specified date delimiter (the default value is “/”) because there is a function to eliminate the character input other than, you do not need to check in the code the validity of the date input. In addition, you can also limit the input of a date that exceeds the preset upper limit and lower limit. The drop-down calendar Date input component, you can easily use the drop-down calendar in the specified property. Guidance display function Date input component, when the focus of the acquisition, will be able to display the Hint string in the status bar. Therefore, since the coding for displaying the input guidance is not necessary, it can be reduced man-hours. Selection range specification function of AutoSelect Date input component, you can specify the selection of text when the focus of the acquisition. Extension of the movement keys Date input component can move the control with arrow key, the Return key other than the TAB key of the Windows standard. Input cancel function If it is before the movement of the controls, you can return the value of the previous input by pressing the [Esc] (Cancel key). 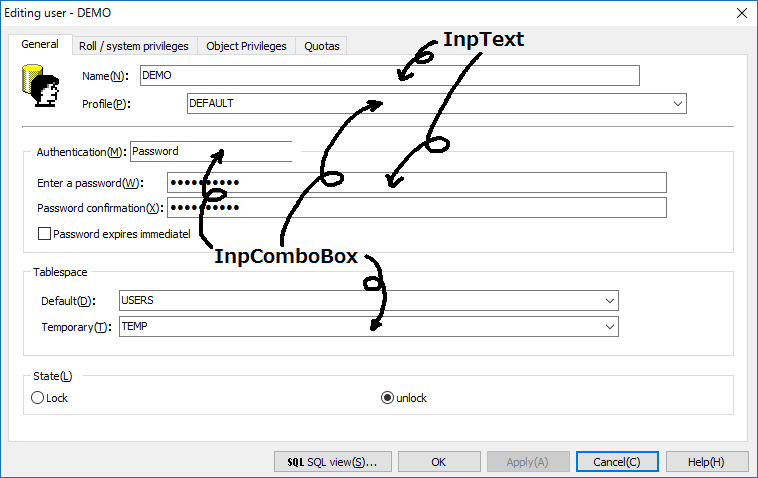 InpComboBox / LabeledComboBox component (hereinafter the extended combo box component), and extends the functionality of the standard ComboBox components in Delphi, and easier to use. Describes characteristics of the extended combo box components and basic settings here. Multi-column display of the drop-down list Expanded ComboBox component, you can display the data of a plurality of columns in the drop-down list. Also, you can omit the troublesome coding because the column to be displayed in the edit box can also be specified in the properties. Acquisition function of any string of drop-down list Expanded ComboBox component, you can retrieve any string from the items that have been selected in the drop-down list. イIncremental search function Expanded ComboBox component, against the data of the input data and the drop-down list, incremental search function is equipped to automatically display the candidate. Guidance display function Expanded ComboBox component, when the focus of the acquisition, will be able to display the Hint string in the status bar. Therefore, since the coding for displaying the input guidance is not necessary, it can be reduced man-hours. High formatting features degree of freedom Expanded ComboBox component can appoint the acquisition of the focus, a color and a font of the control at the time of the loss. Therefore, because can judge an input position intuitively; at the time of the input of the end user can relieve stress. Extension of the movement keys Expanded ComboBox component can move the control with arrow key, the Return key other than the TAB key of the Windows standard. It automatically adjusts the width of the drop-down list Expanded combo box component, you can automatically adjust the width of the drop-down list on the maximum length of the field. Setting function of focus at acquisition of control width Expanded ComboBox component, receives the focus is extended to the width is automatically of control, the contents of the long string that does not fit in the control be easily input, you can display.